Some people might call her crazy, some might call her optimistic, but I call her One Brave Super Mom. My sister-in-law J.J. courageously traveled thousands of miles to a different country with her 2-year old son, just to visit us in France! Thanks to the (huge) help of her parents, the trip went smoothly and can officially be considered a success. When I asked J.J. if she minded sharing some tips on traveling internationally with a 2-year old, one of the first things she said was, "Well, I think this age is probably the worst time to travel with a child, but I wasn't going to let it stop me!" I just love that attitude. And you know what? Yes, Dylan was fussy at times and had a bit of a rough sleep the first night here, but overall I would say that he really enjoyed France. I like to think that he's glad he came and that he has a Mom who was willing to take a chance and bring him. I mean, really, how could you ever leave this cute face behind?! If you're feeling brave enough for an International Adventure with your toddler, hopefully this advice that I compiled from J.J. will help ensure that your trip is as smooth as possible: 1. Book an evening flight. This may seem obvious, but it will be the best way to ensure you have a quiet flight. Dylan fell asleep quickly, kept on his schedule, and had a much easier time adjusting to the time change when he arrived in Paris (as opposed to the trip home when they took a day flight. This caused problems on...a few different levels!) 2. Bring your own. Diapers, snacks, wipes, hand sanitizer, etc. J.J. felt comfortable having brands and flavors of snacks that Dylan was familiar with and that she knew he would like. She brought a lot of awesome organic fruit and veggie drinks that Dylan loves (and that don't require refrigeration - great for international travel!) like HappyTot Pouches and Plum Organics Mish Mash, These were a perfect solution for the days when Dylan was feeling fed up with his local culinary options (so French of him! )- J.J. gave him these instead and knew he was getting some good nutrition. 3. Ask your doctor for a general antibiotic to bring with you. Of course there are hospitals and doctors here in France, but it's a good idea to have something on hand if your child starts getting sick. That way you don't have to mess with finding a doctor, getting an appointment, dealing with the language barrier, and sorting it all out with your insurance when you get home. It's also a good idea to bring some children's Advil and Benedryl with you since the same name brands aren't carried here, which can make it a bit confusing determining what to buy in the pharmacy and the correct dosage to use. 4. Show pictures of who you are visiting. I really hate being an aunt that lives so far away and doesn't get to see her nephews often. But J.J. has done a great job of always showing Dylan pictures of me, Michael, and Fig so that he knows who we are. We have frequent Skype dates with him and he practices saying "Hi Michael, Hi Natalie." J.J. even showed Dylan some videos of Figaro playing so that he wouldn't be scared of him in person. Because of all this prep work, Dylan warmed up to us right away, he was comfortable being with us, and he and Fig were instant BFFs. It was so great and made me and Michael very happy. 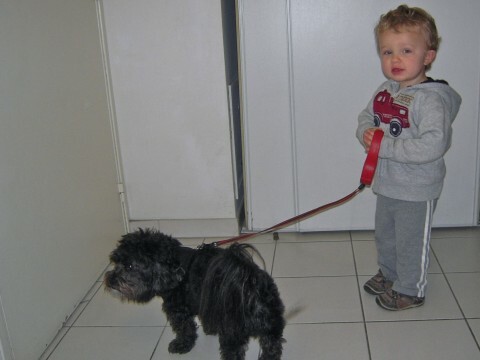 Dylan took Figgy for a walk every morning! 5. Plan ahead for the passport. Yes, even babies and toddlers need to get passports! It's a bit of a process, so J.J. recommends starting a few months in advance of your trip. Keep in mind that both parents need to present for the passport application appointment and you need to bring the original birth certificate. Once you have the passport, it's valid for 5 years. 6. If you can, book 2 tickets for you and your child. I know it's a cost savings to be able to put your kids on your lap until they are 2, but booking 2 tickets (if you're financially able to do so) is especially important for an international flight. It just helps to have the extra space so that everyone, your row partner included, is comfortable and can (hopefully) get some sleep during the long flight, making it much easier to deal with jetlag. Your neighbors will thank you. 7. Use Skype. Or Facetime, or Google Video chat, or whatever as a way to keep in touch with anyone needed back home. By doing this, J.J. was able to have Dad involved in bedtime every night so that Dylan could say good night and keep some continuity in his bedtime routine while he was in an unfamiliar place. 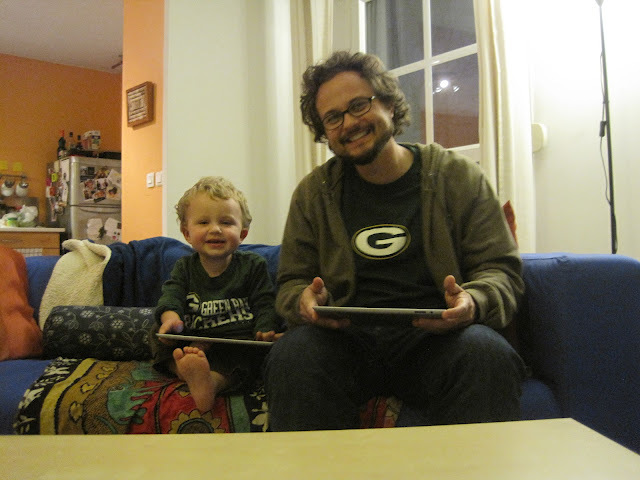 how cute are these two with their Packer shirts and iPads?! 8. Consider a Toddler bed. J.J. brought this awesome fold-up bed with her (it fit right in her suitcase!!) for Dylan to sleep on. He started sleeping in this new bed a few weeks before their trip, so he was comfortable with it by the time they arrived. J.J. conceded that maybe she didn't need to bring it after all since they were sharing a room and Dylan crawled into bed with her each night (something he has never done at home!) but she still wanted to recommend it to you all since it's so portable and child friendly. 9. Stay in an apartment vs. a hotel. Since there would be 6 of us, we decided to rent an apartment for our time in Paris and this was such a great arrangement. We had our own refrigerator to stock up on foods and plenty of room for us to all lounge around and hang out together. Staying in an apartment when traveling is nice to do as a family, as it creates more of a communal experience. 10. Stock up on new toys. They don't have to be fancy, but having a shiny, new object to pull out in a time of crisis can be a lifesaver when traveling. J.J. went to her local dollar store and stocked up on toy cars and trucks, writing pads and little books that she shared with Dylan slowly throughout the week. 11. Consider a roller attachment for your carseat. If you're traveling with your carseat, having a roller attachment like this one is a huge help for getting it through the airport. If you're checking the carseat, keep in mind that some airlines do not provide a bag for it, so you probably want to have one on hand just in case so it doesn't get scratched and dirty during transit. 12. Plan to do laundry. If you can, this will be a huge space saver when packing. Especially for your own clothes! Poor J.J. had her tiny little suitcase for 10 days and a giant one for Dylan with all of his diapers, wipes, toys, food, bed, clothes etc. Still, only 2 bags between a mom and toddler for 10 days abroad is pretty good if you ask me! Since she planned ahead to do laundry at our house, she was able to bring only half the clothes she would have needed to pack otherwise. 13. Bring as many Grandparents with you as possible. I saved the best for last - this is the big one! Gosh, I can only imagine if poor J.J. would have had to schlep through 3 different airports with Dylan, the bags, the carseat, and the stroller all by herself! I'm not sure it would have been possible. Luckily "Nama and Tapa" (as Dylan calls them) were there to help every step of the way. 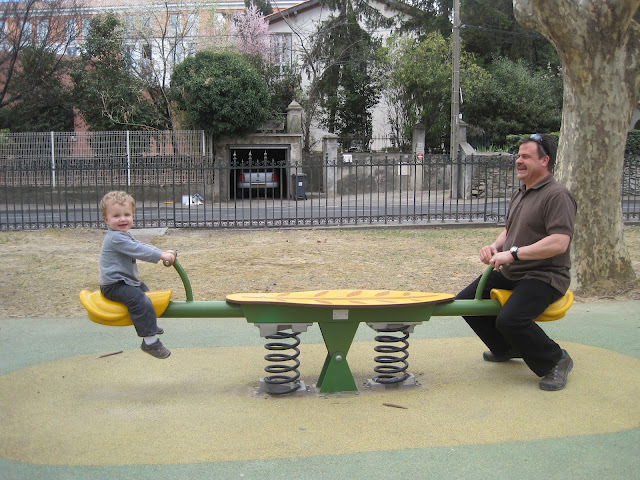 A ratio of 3 adults to 1 toddler seems to be the magic number when traveling internationally. You have one person to figure out what you're doing at the airport and one person to entertain the kid, while the third person is getting whatever the kid needs at the moment. Sounds easy, right? Additional thoughts A few more things that J.J. wanted to point out about traveling in France with a child: - First of all, she said that in both Paris and Montpellier, she felt very safe the whole time. Of course you need to exercise the same caution you would in any major city by keeping your bag zipped and on your body the whole time, but J.J. felt totally fine allowing Dylan to wander around the town squares himself (while watching him, bien sûr) or chase pigeons around the fountains. 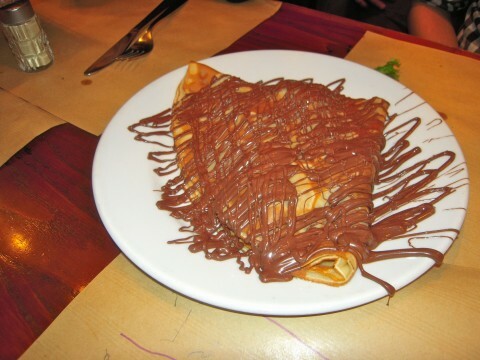 - Probably the hardest part about life in Paris with a toddler was dealing with the late dinners. Most restaurants don't even open until 7:30pm, which means you might not be eating until 8pm (if you're lucky) and you're not going home until around 9pm. That did not fly with Mr. Dylan. 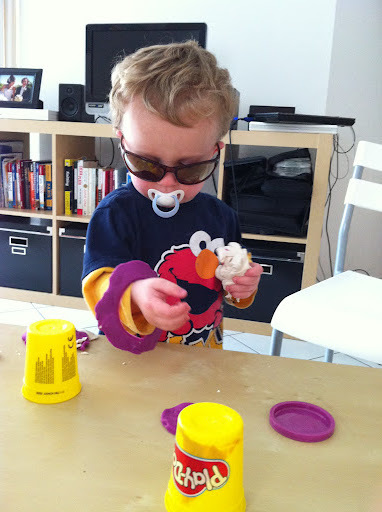 Our evenings in Montpellier were much easier because we just stayed in our apartment and served Dylan his dinner early. We tried to do something similar in Paris, but it was hard being out in a restaurant when Dylan felt he needed to be at home playing with his trucks before bedtime. We managed with very few incidents, but it's just something to keep in mind and plan around. - There is a serious lack of changing tables in Paris. Seriously. I don't think I ever saw a single one anywhere. Be ready for that. - Just keep an open mind about your trip. Remember that you might be spending more time on Carousels and Teeter-Totters than seeing the great works of art from the Renaissance period. Dylan did a great job of walking around (or being pushed!) while we took in the sights. He even went to the Musée D'Orsay! But our trip to Versailles proved to be too much for him, especially because strollers are not allowed inside the Château. Since I'd already been several times, I took J.J. and Dylan back to the front to reclaim the stroller and we went out for a walk (and a nap for Dylan!) in the Gardens while Michael and his parents finished touring the Château. Contingencies! isn't this why everyone goes to France? to see the great Teeter-Totters of the region? Finally, while this is not a particularly comprehensive list, I wanted to share with you a few of the places that Dylan most enjoyed in Paris. I'm not sure I would call these Child Friendly because Paris just has different ideas and standards about children. I guess I would call them Child Tolerant. 1. Tuileries - This large park is a nice, open, and secure place where children can run around and do what they love to do in Paris: chase pigeons. There's also a Carousel and large fountain where you can rent wooden toy sailboats on the weekend to float in the pond. It's nice for parents too because if you start on the west side of the Tuileries, you can take in some sights for yourself. Start at the Place de la Concorde and you can see (a view of) the Eiffel Tower and the Arc de Triomphe. You can continue your walk all the way through the gardens and end at the Louvre. 2. Tour Eiffel. 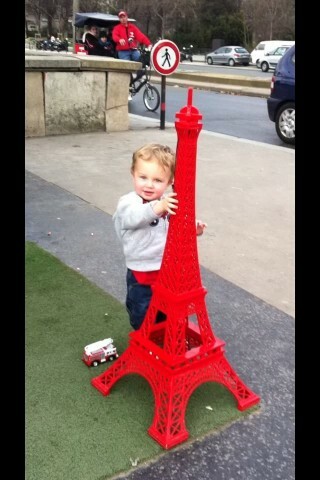 Dylan loved the Eiffel Tower!! Well, actually, what he loved was this little replica beside the Eiffel Tower. This photo was taken shortly before we got yelled at for letting him climb on it. So maybe the Eiffel Tower doesn't belong on this list. Dylan kept yelling "Tower! Tower!" 3. 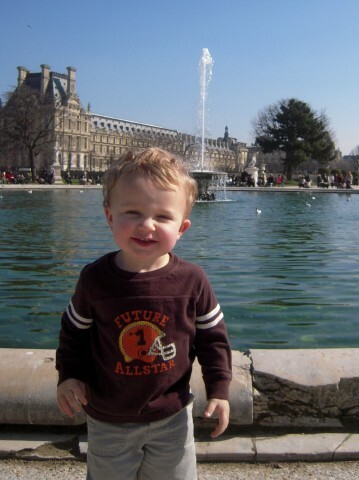 Jardin du Luxembourg - This is probably my favorite place to go in all of Paris, so I was very happy that Dylan liked it too! In the summertime, the large esplanade is open for picnicking and sunbathing on the south end of the gardens. 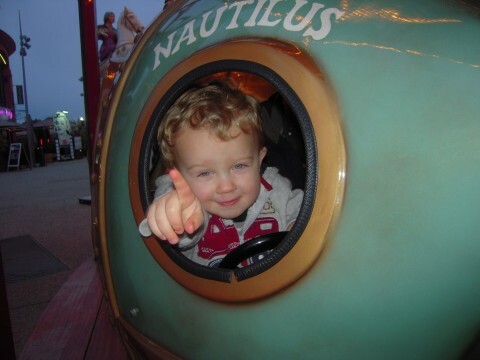 to the west you'll find a large playground (with a small entry fee) and another Carousel. "aren't French carousels just the best?!" 2. Batobus - Did you think we were going to let Michael's family come and NOT take them on a Boat Tour? Please. The Batobus, which is a hop-on/hop-off Boat Tour was perfect for Dylan. 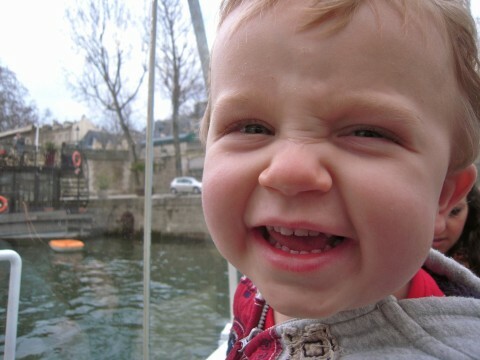 He loved being on the boat and if he got fussy, we could just hop off. It was a great way to travel to all the different sights (we took it down the Seine to the Eiffel Tower) without the hassle of dealing with a stroller on the metro or walking all the way there from the Marais. In fact, even if you don't have kids, it's a fun, relaxing way to get around. Dylan having a great time on the Batobus! 5. Crêperie Suzette - Out of all the places we attempted to eat dinner, I'd say that this place wins the award for "being the nicest to children." The staff was really great and gave us a large corner booth in the back. They even had paper placemats and gave Dylan markers to color with. Nevermind the fact that most of the markers were dried out and dead, it was the thought that mattered. We all loved our meal, so this place ended up being a winner all around. Even if Dylan never remembers his trip to France, it's something that Michael and I will never forget. We were so happy to be able to spend the week with our precious nephew and see how much he's grown in the last year. I feel so lucky to be part of a family that was willing to face a challenging situation to come all the way out here and spend time with us. Merci! Excellent story and great tips. I agree that traveling with a 2 year old makes us a little hesitant. However this is very much a reminder that it can be done. At the end of the day, it is better to try something new than to worry about what might go wrong. Totally agree, Matt! It might be difficult at times, but better to try than to not have the experience at all. You can do it!